Cucumber belongs to the family of the cucurbataceae same group as watermelon, squash, zucchini and pumpkin. They are made up of 95% water, thus making them one of the favorable fruit in a hot summer day to refresh your body. Cucumbers are good sources of other essential minerals and vitamins like flavonol (fiselin), an anti-inflammatory that aids our brain health especially among Alzheimer’s patients. Cucumber contains lignan, a polyphenols which help prevent the risk of cancer and other cardiovascular disease. Generally cucumbers are low in calories and high in fiber, which make them good for your digestive health and weight loss. Other nutrients include potassium, calcium, mangnessium, manganese, and vitamin A, C, E and K.
Cucumber has several healths benefit among which are enumerated below. One of the health benefits of cucumber is that it keeps the body hydrated. It has been established that cucumber contain 95% of water, this means that eating this snacks in a hot summer refreshes the body and make you feel good. Cucumber is rich sources of fisetin an anti-inflammatory flavonol that is commonly found in fruits and vegetables such as apple, strawberries and onions. There are several clinical studies which indicate that fisetin might protect against Alzheimers disease and improve the overall healthiness of our brain. Lignan, a polyphenols found in cucumber may reduce the risk of cancer especially breast, uterine, ovarian and prostate cancer. Cucumbers are also sources of photonutrients known as cucurbitacins. They contain cucurbitacins A, B, C, D and E. Scientist is still working round the clock to determine the extent of anti-cancer properties of cucurbitacins. However they have already found that several different signaling pathways like (the JAK-STAT and MAPK pathways) required for the development of cancer cell and survival can be blocked by the activity of cucurbitacins. Remember that cucumber contains 95% of water, and it contains both soluble and insoluble fiber that aids the passage of food easily through the digestive tract. It keeps the stomach in good shape thereby preventing constipation and discomfort. A 100g cucumber contains about 16 calories, thus cucumber is said to be a low calories food. However cucumber contains both soluble and insoluble fiber that helps you to slow down digestion and make you feel full and help maintain a good and healthy weight condition. One of the many benefits of eating cucumber is that it supplies the body with essential vitamin like vitamin A, vitamin B, which includes vitamin B1, vitamin B5 and vitamin C. These vitamins increase your energy production, keeps your body rejuvenated especially the vitamin B and keep your immune system steady especially vitamin C.
Cucumber could help you manage your diabetes and blood sugar levels. Several test-tube have shown that cucumber can regulate blood sugar levels. In one study there was induced diabetes in mice and then supplemented them with cucumber peel extract. 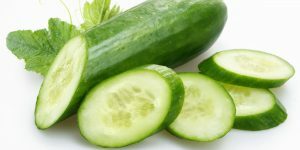 The cucumber peel reversed most of the diabetes-associated changes and caused a decrease in blood sugar levels (https://www.ncbi.nlm.nih.gov/pubmed/20614191). In addition cucumber has zero on the Glycemic index rating, this means that they would not raise your blood sugar levels. Cucumber can therefore be said to be favorite food for maintaining a good blood sugar levels. It is common now are days to find cucumber supplement as spiny sea cucumber extract powder for diabetic patient in many store across the world. 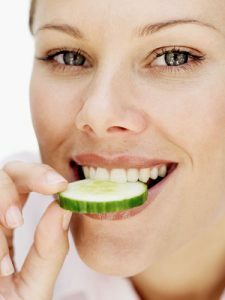 Taking cucumber slice and juice helps you get rid of mouth odor and eliminate the bacteria that causes tooth decay and mouth odor. Cucumber contains phytonutrients that kill the bacteria causing bad breath, thereby enhancing healthy teeth and gums and keep your breath fresh. Regular consumption of cucumber and the seed neutralizes acids in the mouth and promotes saliva secretion. Cucumber is said to be a natural diuretic food because it contain an active cleaning properties which help flush out accumulated waste or toxins from your body, thereby keeping your bladder and kidney healthy and maintaining general body wellness. 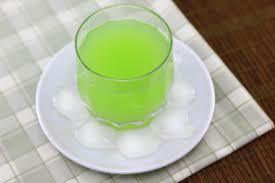 Taking cucumber and cucumber juice on a regular basis could be very helpful for your body. Another health benefits that cucumber could give you is that because it contains some significant quantity of vitamin K. Vitamin K is helpful for our bone health: it reduces bone loss, and decrease risk of bone fractures. Cucumber supplies us with about 21% of our required daily recommended allowance of vitamin K.
Cucumber is beneficial to the skin in several ways which has been utilized by many people to maintain a glowing and healthy skin. For example, the juice of cucumber or pureed cucumber can be used directly on your skin to remove tan or to relieve sunburn. A simple combination of pureed cucumber can be mixed with yoghurt to treat to treat blemishes. 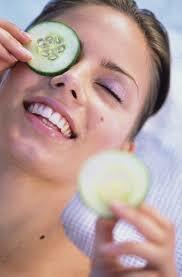 Cucumber also contains important nutrients silica, which is useful for our beautiful hair and nail health. Cucumber juice can be apply to the hair and scalp, leave for at least an hour, then rinse with shampoo, after wards your hair comes out shiny and beautiful. Foods rich in silica like cucumber not only helps improves the appearance of nails, it also helps to keep them firm and looking beautiful. How do I choose and store my cucumber? Look for firm dark green cucumbers with no soft spots. Avoid cucumber that are yellow, have sunken water-soaked areas around the skin or wrinkled skin, that’s a sign that it has began to deteriorate. Always buy organically certified cucumber, by this you reduce your likelihood of exposure to contaminant such as pesticide. 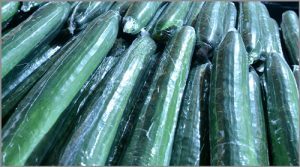 Cucumber should be stored in the refrigerator when you are not consuming them immediately, if the cucumber has been cut, then wrap the remainder tightly in plastic before storing to enable it retain its moisture level. Do not store cucumber for too long, for maximum benefits cucumber should be used within two to three days of storage.